This is my fancy-schmancy chicken salad recipe. I've called this one Golden Pecan because it has golden raisins and pecans (which is my favorite combination) but when you look below you’ll see different fruit and nut options if mine aren't your favorite. There’s a little trick to this recipe that you don’t want to skip. I saw Julia Child do this once on a cooking show and it’s been scorched into my brain ever since. You “marinate” the cooked chicken in the seasonings and a little olive oil before adding the other ingredients. This helps the chicken absorb the flavors and stay moist. You don’t have to use near as much mayo when you make it this way either. So, the end result is more flavorful and you don’t have use as much mayo? Double score! I’ll be posting my plain jane version soon – stay tuned! Combine chicken, olive oil, thyme and salt in a medium bowl and mix well. Cover and refrigerate at least 30 minutes (or up to 4 hours). Add mayo, pecans and raisins and mix well. Salt to taste if necessary. Cover and refrigerate until ready to serve. *Any leftover chicken will work but when I’m making this from scratch, I poach chicken breasts in a little water liberally seasoned with salt and pepper. And I always, always, always use the bone-in split chicken breasts with skin because the chicken is so much more flavorful than boneless/skinless chicken breasts. And when I’m done I have a rich, yummy chicken stock leftover to pop in the freezer for later use. 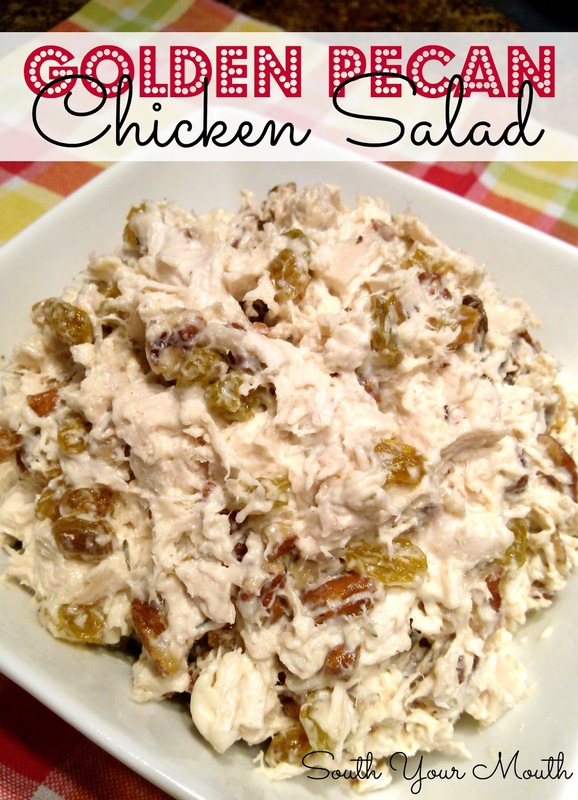 I've never been much of a chicken salad girl, but you have never led me wrong. So, I will be trying this one! I had never heard of the tip to marinate the chicken before adding the mayo. It makes perfect sense! Thanks for sharing! Definitely pinning this one!